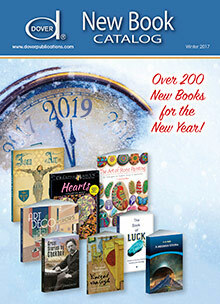 Dover Publications gives book lovers access to the most affordable titles, featuring books for every reader and every interest. Enter code - CCD4 - at checkout on the Dover Publications website. Thrift Editions - Whether you're a play or poetry lover, a fan of fiction or nonfiction, you can now supplement your home library with ease, thanks to an exclusive collection of unabridged classics that celebrate all of your most beloved literary treasures. Explore the Dover catalog to find a wide range of Thrift Editions, from a set of Charles Dickens classics for your next book club meeting and the musings of legendary American poet Walt Whitman to more fine editions that will be sure to complement any classic book lover's collection. Music - From Beethoven to Bach, Chopin to Tchaikovsky, you'll enjoy access to all of your favorite composers with over 750 Dover music books and scores. Simply search by composer to find your specific selection, with titles that range from piano and keyboard music to opera, choral and orchestral scores, chamber music, miniature scores, and more editions and publications that are must-haves for any music teacher, student, or performer. Science & Mathematics - Discover classic mathematics and science literature priced well below comparable editions from other publishers. Browse the Dover catalog online for Biology, Medicine, and Chemistry textbooks, Earth Science, General Science, and Physics books, Astronomy, Computer Science, Engineering, and Mathematics titles, as well as the Phoenix Editions, an impressive collection of hardcover volumes covering the fields of Mathematics, Science, and Engineering, brought back into print at the urging of teachers, students, librarians, and other noted education professionals. Art & Crafts - Skilled illustrators and art history scholars alike will find perfect publications to suit any artistic interest. Shop a vast selection of design, art history, and art theory books, as well as illustrations, sketches, drawings, and prints compiled from the works of the world's greatest artists. From quilting and woodworking to origami, you'll also find over 800 craft books that are ideal for crafting enthusiasts of all interests and skill levels. Literature - Explore hundreds of the lowest-priced literary editions available from an extensive collection that includes audio books, large-print classics, world-famous Thrift Editions, and other important works of American, English, and world literature, from affordable fiction and nonfiction titles to critical essays, humor books, poetry, and dramas, all from a long list of highly acclaimed authors. Since 1941, Dover Publications has delighted American readers by providing them with an affordable selection of reprinted classics and books that cover a broad range of subjects. From scientific and mathematical texts to children's books, great literature to Dover music scores and language phrasebooks, you'll find hundreds of extraordinary books at extraordinary values.